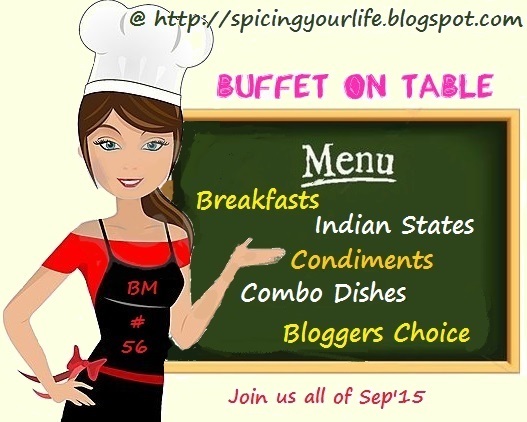 We are coming to the last day of week 1, Buffet on Table, where we are doing Combo Dishes. With so many savory and dinner ideas done, I suddenly realized I could pick up a dessert. Infact my choice was another interesting dinner combo that will have to come out some other time. When I think of a dessert combo, all I could think of was Chocolate Brownie with Vanilla Ice Cream, which I have already done. Other than that I could only think about Indian Dessert combos like Gulab Jamun – Ice Cream. Carrot Halwa – Ice cream and Jalebi- Ice Cream. I know there is this Ice Cream Cake. I ended up thinking that the choice are so limited and looks like we can’t think beyond Ice cream. I know I didn’t check out Apple Crumble then, though whenever I look at apple, I remember this dish. Its not often I cook with fruits. So its a chore to actually plan something with fruits. I went with checking Apple Crumble and I was so delighted to know the history of this dessert and how different it is served in different countries. 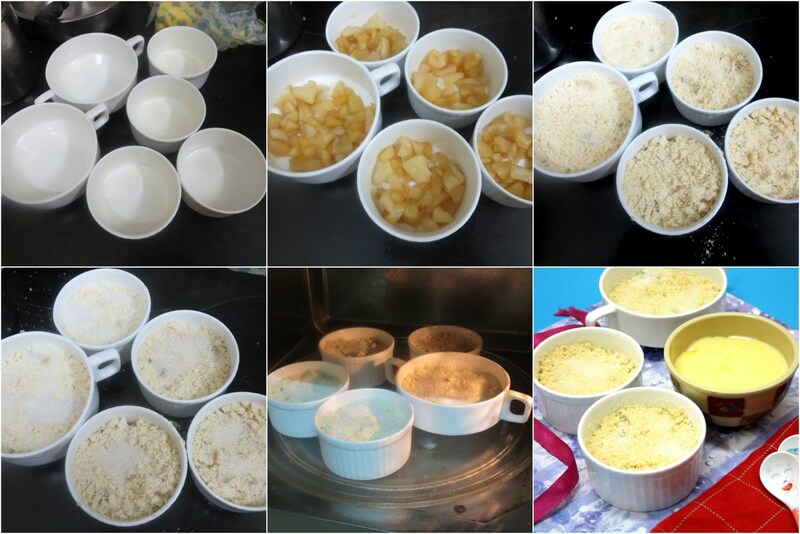 Apple crumble is a British pudding traditionally served with Custard. Though over years, it was also served with cream or ice cream. I was thinking if I should really make this or pick up something else, since I have the Vanilla Custard recipe on the blog already. However since that is anyway a ready made custard powder recipe, there really is nothing new I will be making. And decided to go with Apple Crumble with Vanilla Custard. Since I always make sure to have some desserts prepared for Sunday Lunch, I thought this will be the best chance to make use. I could get Hubby dear eat this and give his feedback as well. He loved it so much that he polished off the extra bowl and said it was intoxicating and lured him sleep. He infact napped like a baby and wanted another one for dinner! Said I will have to remember to repeat this dessert. I readily agreed and hearing our conversation, Konda was upset that I was ready to agree to repeat this, whereas I have not repeated her request. I said time is too short to repeat all her cakes and cheesy stuffs and there must still be so many other sinful dishes for to try! I guess a lifetime is not just enough to try all the dishes across the globe! I hope you all enjoyed the Combo Dishes that I made for Week 1. come back next week for a feast featuring Indian States! Wash, peel the skin and core the apples. Chop into thin 1 inch pieces and add 3 – 4 tsp of sugar to prevent from browning. 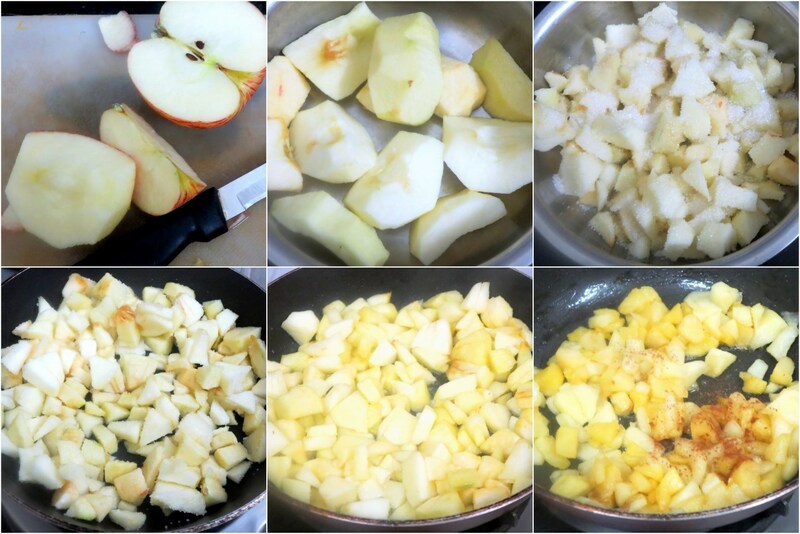 You can also add a few drops of lemon juice if you are not going to cook the apple right away. Cook on a low fire until soft and mushy. Just before taking it off, sprinkle the cinnamon powder, mix well and remove to cool. 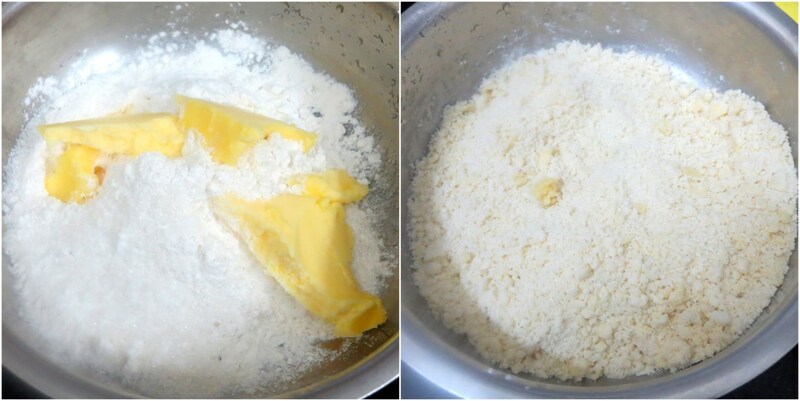 Take the flour in a bowl, add sugar and cold butter. 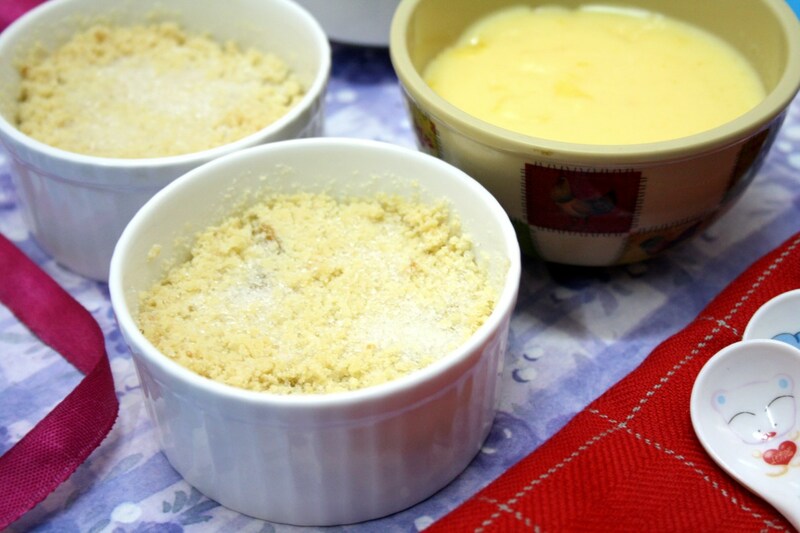 Crumble with your fingers so that the flour gets coated with butter and turns to become crumbs. Make sure you are not kneading to a dough. Since I was baking in single serve ramekins, I greased as many bowls as needed. Else you can bake all in one baking tray. First goes in the apple layer, on top of it will be a layer of the flour, evenly spread. Gently press down. Sprinkle some sugar on top. Bake in a pre-heated oven at 185 C for 30 – 40 mins. You can check if done after 30 mins. Ensure the apple crumble is warm before serving. So MW for 30 sec if required and serve with chilled custard sauce. Such a wonderful combo, would love to eat a bowl or two. Beautiful and yummy combo… Glad your family liked it. Haha, I can reading the post I was think, wish it were crumble & ice-cream.. 🙂 Apple crumble & custard sauce looks wonderful and must have tasted wonderful. 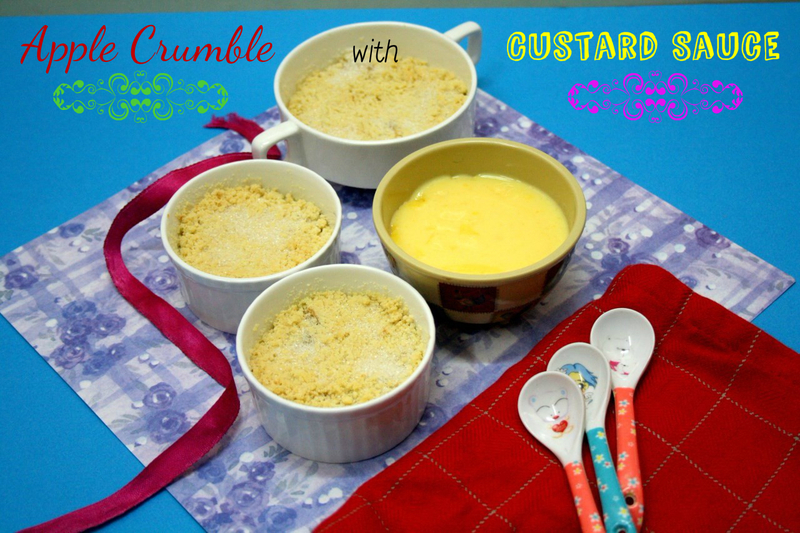 Wat a wonderful combo to finish this week's marathon,usually we have crumble with icecream but never had crumble with custard sauce, wish i could make some very soon.. I must keep this combo in mind while we have dinners, easy yet delicious and unique. Loved it Valli. Love this combo.. already tried apple crumble with icecream, its really awesome in taste and love it your microwave version. Must try this combo, always had apple crumble with ice cream. Loving this combo. Fruit based desserts are great na..
Love to finish my meal with fruit based dessert..Such a nice combo..
Fruit crumbles are easy to make and tastes so yum. 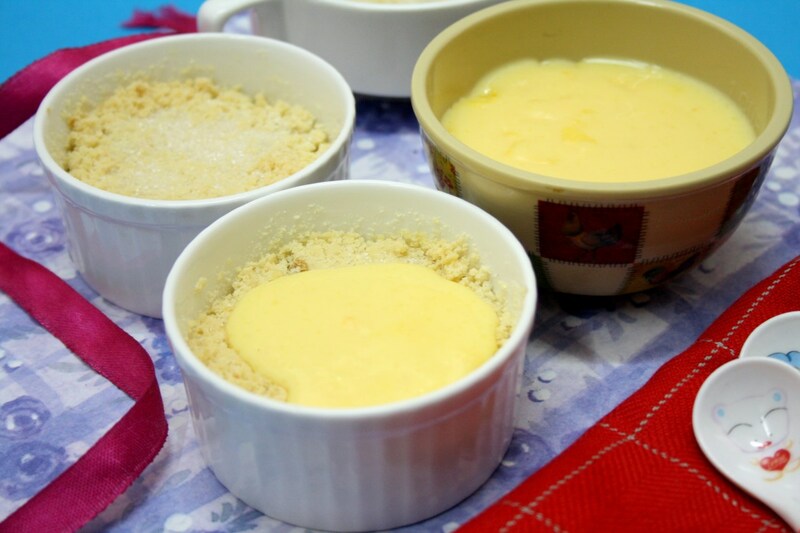 Your custard and the apple crumble looks so tempting..
That is a wonderful combo, Valli. Should try it sometime soon. What a delicious and tempting apple crumble. I will definitely try and make it some time. That sure is a wonderful combo. I usually go with 2 minute microwave version for individual servings which also happens to be my kids' favorite. Rightly said! A lief time is not enough to try out the different dishes across the globe!And where is the time for repeat requests!!! And this combo sounds so delicious and now I need to buy apples just to make these. 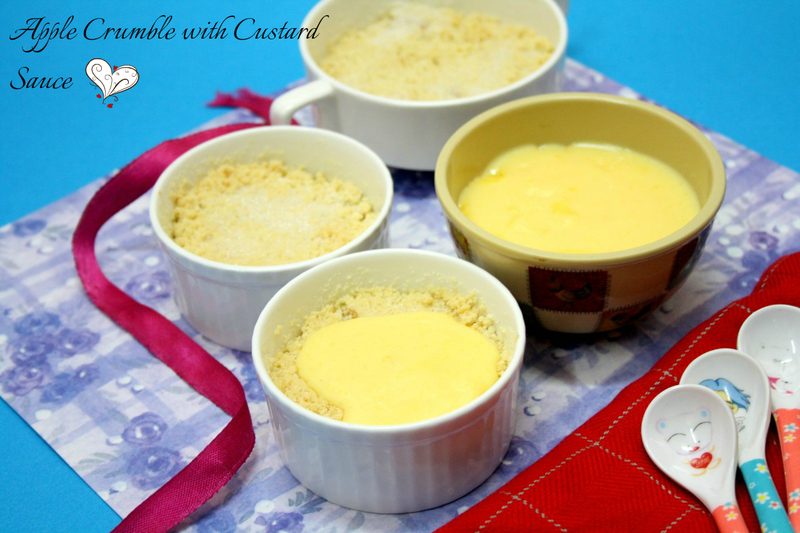 I love custard in any form and with a apple crumble it will marry so well 🙂 am drooling over here .. wat an fantastic list of combos you made valli .. awesome ! !